A high response action created by an ultra-thin body. By giving this lure an extremely thin body, we have realized one of the widest wobbling actions for any sinking pencil type lure. The sinusoidal movement leaves a wake which is irresistible to the game fish. The response to rod movement is also great. Light twitching of the rod will produce an agile flashing of the lure’s side. 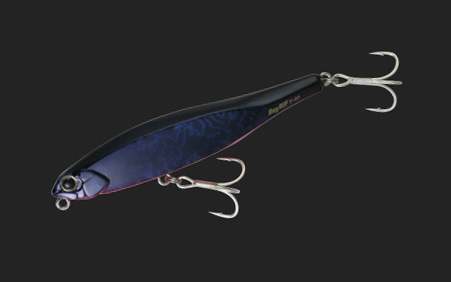 Even if the lure is only sinking, the ultra thin and flat body appeals well. The fixed weight allows tight rolling of the body while it sinks horizontally, creating a strong flashing effect on the sides.